No one likes a stinky house right? For us moms who have little ones in diapers, bad smells are simply inevitable. Even when there are no lingering smells, sometimes we just like to have a fragrant aroma to brighten our mood. So what do we do? We spray air fresheners or plug-in an oil one or burn fragrant candles. Mmmmmm, love that vanilla or refreshing citrus! Unfortunately, that lovely scent really isn’t so lovely. No, what you are really smelling and inhaling into your body are harmful chemicals. Ever walk into a bathroom after someone has gone crazy with a spray air freshener? Oh my god it is suffocating! Just that alone is an indication that they are not healthy. And most air fresheners contain phthalates. You may remember I mentioned them in my post about toxic shower curtains. Yes, this toxic chemical was found in over 12 common household air fresheners. Some of these were even labeled as “all-natural!” Unbelievable. Since manufacturers are not required to list all ingredients, its hard to tell which ones are the culprits. Candles really aren’t much better. For starters, traditional candles are petroleum based (paraffin wax). They are loaded with artificial dyes and synthetic fragrances which result in indoor air pollutants. They also can contain other toxins like acetone, lead, and benzene (know to cause leukemia). So what are your other choices? Instead of your typical air fresheners, opt for all natural alternatives like diffusers with essential oils. 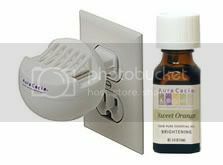 I use a plug in diffuser from Aura Cacia along with some Aura Cacia 100% Natural Essential Oils. My favorite one to use is Sweet Orange, its just so invigorating! William loves it too “Mommy, I smell oranges in my nose! Smells Good.” There are many types of diffusers or you can use a candle lamp, which is similar to a tart warmer. Just make sure your tealights are all natural soy or beeswax. In our bathroom I keep some Aura Cacia Aromatherapy Mist. Do you see a trend here with my brand of choice? The ingredients are water, grapefruit oil and tangerine oil - that’s it! Plus it is non-aerosol. Love it! For candles, buy ones that are made from natural waxes like soy or beeswax. They should be fragranced with 100% natural essential oils. It’s important that they are essential oils and not fragrance oils, the latter are synthetic. An extra benefit, soy candles burn cleaner! They are not completely soot-free; they produce a small amount of white soot. But it is not harmful like the black soot from the paraffin wax candles. I don't really burn candles so I can't give you a personal favorite. But you can visit Etsy and do a search for natural soy candles and you will find a ton. Great post. I use Aura Cacia essential oils and I did not know they had an air freshener. I just use cotton balls around the house. Thanks for sharing. I think I am sad though. I like my candles. I may have to get that air freshener. I use Aura Cacia's lavender body polish, smells so pretty! Do you know if Glades has phthalates? Scary! A 2007 study showed that both Glade Air Infusions and Glade Scented Oil Plugins contained them. (http://www.nrdc.org/health/home/airfresheners/fairfresheners.pdf) although the parent company (S.C. Johhnson) announced earlier this year that they would be phasing out phthalats.